Three weekends down in Cleveland, and last weekend definitely tops them all. Why, you ask? 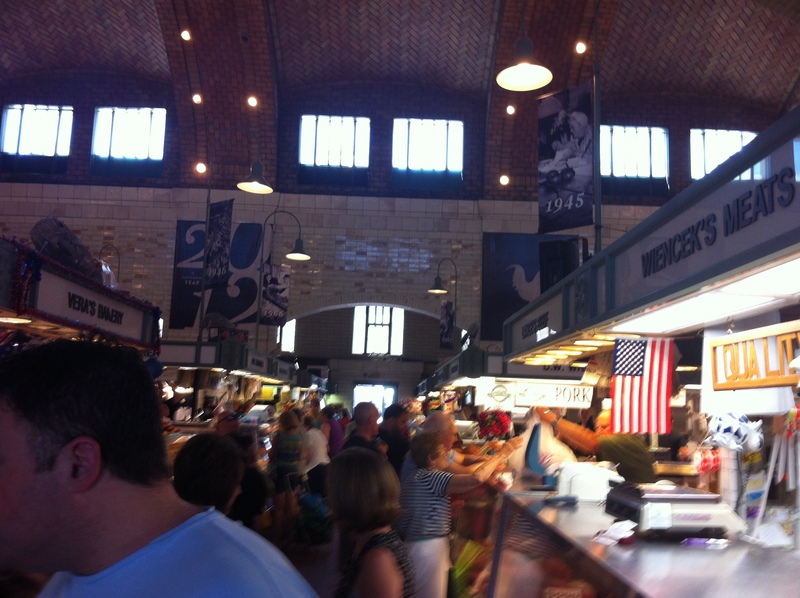 Well it’s due in large part to my first trip to West Side Market with my roommate Jessica and her boyfriend. The iconic West Side Market clock tower. Also, Ohio weather is beautiful. The market is one of the biggest and most beautiful farmers markets I have every been to, and I’ve lived in Missouri, land of really important legacy beef and farming products. I wasn’t prepared to be able to do my grocery shopping their either. I figured, as with most markets I’ve encountered, that beyond a nice treat or some freshly baked bread, the majority of the items wouldn’t jive with my college intern salary. Boy was I wrong. 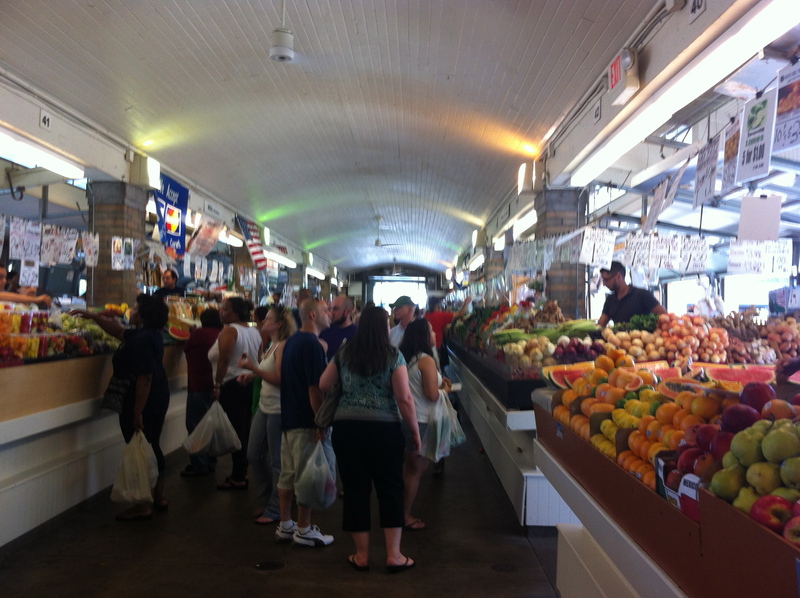 The produce side of the West Side Market in Cleveland. And this was the small building. Not only was the produce the best I’ve seen in Cleveland stores so far, but it was reasonably priced. The meat, too, was comparable to grocery stores, aside from the specialty cuts or super fancy steaks and more exotic options. At $1.99 a pound for chicken and $0.99 for a bundle of asparagus, this could easily become my go-to location for meat/produce/baked goods. Really, they have everything except the Botan Calrose sushi rice I can’t seem to find anywhere in Cleveland besides Wal-Mart. Sorry, I’m a rice snob. But if you ate as much of it as I have in my life, you would be too. Rice and spices! And so many kinds! 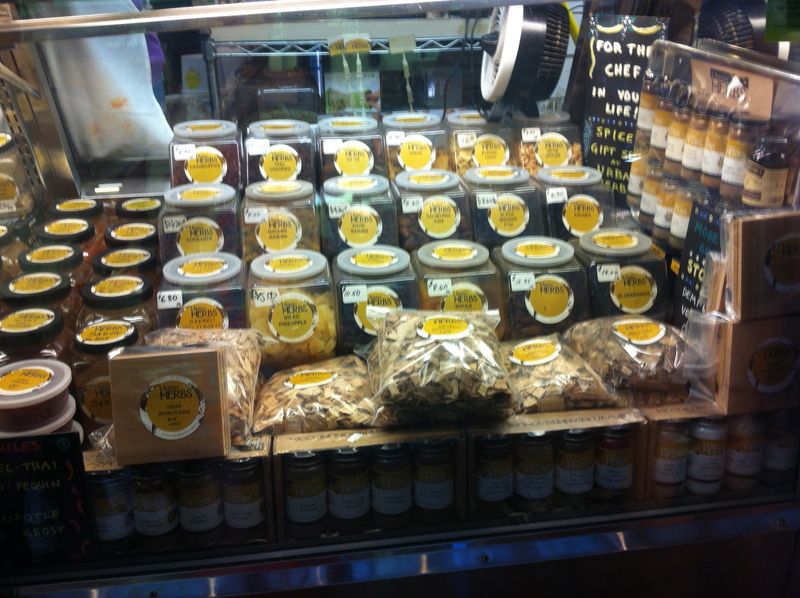 Even more than the prices, I just loved the feel of the market. It was crowded, but you could tell it was that good kind of crowd; the crowd that means everything here is too good to pass up. It was even a nice crowd. Jostling through so many people with bags and strollers and limbs gets you death stares in the subway in NYC, but here, I think everyone apologized to me, even when it was my fault! The adjoining prepared food off-shoot rooms looked equally as delicious as the cases in the bigger room. I have a craving for shwarma (and have since I got back from Israel almost four years ago), and I definitely know where I’m going to get it. Counters upon counters of food in the dairy/meat/bakery building. Great Lakes Brewery, which I can cross off my to-do list from my last post. For Columbia-dwellers, think of it as an upscale Heidleberg: friendly, casual, slightly rustic, with reasonably priced food and good beer brewed on-site. And I still managed to make it out to Beachwood Place mall, which, while very nice and head and shoulders above college town malls I have frequented, still can’t hold a candle to Woodfield.Sorry Cleveland, but Schaumburg still out-retails you, at least in my opinion. To Beachwood’s credit, however, there was a Nordstrom, Saks, Gap, Banana Republic AND Fannie Mae candy shop. Not bad, Cleveland, not bad. Eavesdrop like crazy. That’s how you learn to interview better. I originally got this tip from one of my editor-professors Jacqui Banasyznski in her class on interviewing essentials, and it’s worth it’s weight in gold. Because I sit right in the middle of my department, I get to hear a lot of different styles and approaches, and it’s like a crash course in interviewing every day. The people here are really, really helpful. My cube mates have been generous in both baked goods and tips about what to do in this awesome city. Janet Cho, our social media/retail reporter, gave me this cool checklist of 100 things not to miss during a summer in Cleveland. So far, I’ve accomplished only a fraction of what I’d like to do. Michelle Jarboe McFee, our real estate and development reporter, took me and another intern for delicious dinner at Happy Dog, which she described as “very Cleveland.” Between them and the rest of the people I’ve encountered here, I’m not wanting for advice, conversation or a fun evening out. Communicate, communicate, communicate. Whether its with graphics, my editors or sources, everything works out better when everyone is updated and knows what to expect. I’ve already been told by a source that he was impressed by how communicative I was during the reporting process (accuracy checking, emailing links, etc.) and I really owe it all to the great editors I’ve had so far at the Missourian who’ve pushed me to engage (cough, Joy Mayer). What I’ve learned to do there by way of engaging is just as important here. Ledes and nut grafs will always be the hardest parts of a story, and a good editor will always send you back to rework them, not matter how lovingly you might have crafted the first ones. They can always be better, and nine times out of ten, the news is buried or the nut graf should be the lede. My PD editors are no different than my Missourian editors in this regard — thanks for making me constantly work on this. I’m always surprised how the simplest suggestion from fresh eyes can make the biggest difference. It’s important to be in touch with your readers. I’ve already gotten at least 10 phone calls from readers with questions about my stories, and even more comments on our website. Not every comment warrants a response; some people are just adding to the discussion or bringing up their own concerns. But I still pay attention to what’s being said so I can jump in with answers or explanations, need be. The Plain Dealer is the biggest newspaper I’ve worked at so far, and its reach is far. Part of maintaining its reputation in the community and my own as an informed, responsible reporter is to make sure I’m available and listening. Almost halfway through, I can’t believe how much time is flying! Coming up this weekend: a visit from my dad, the Rock ‘n Roll Hall of Fame and more good food! 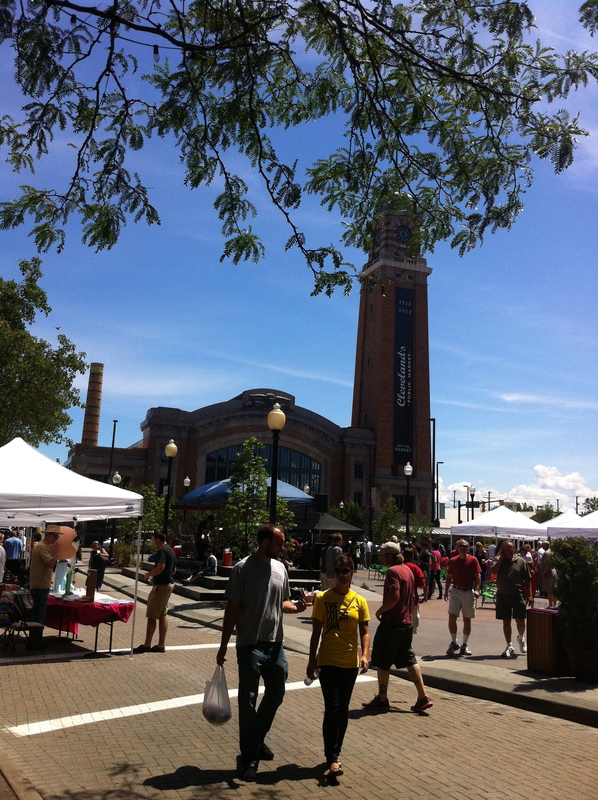 This entry was posted in Internships and tagged Cleveland, food, internship, journalism, mall, Missourian, ohio weather, Plain Dealer, restaurants, summer, West Side Market. Bookmark the permalink.